One of the few alpacas to make the trip from North America, Brutus has had a phenomenal impact on NZ alpacas, with over 400 cria on the ground, many of them show champions and Supreme Champions. Brutus is sired by the legendary Hemingway – an icon of the industry around the world – and many of his own offspring have been exported to Europe. He is the sire of the outstanding Silverstream Czar, who shot to fame as the almost unbeatable male in the NZ show ring. 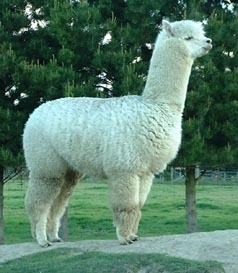 Czar has now been exported to Europe, but he is only one of the many top quality alpacas sired by Brutus.